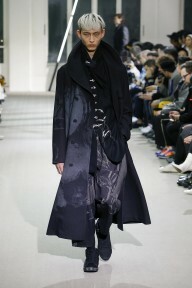 With Hedi Slimane comes radical and precise change. 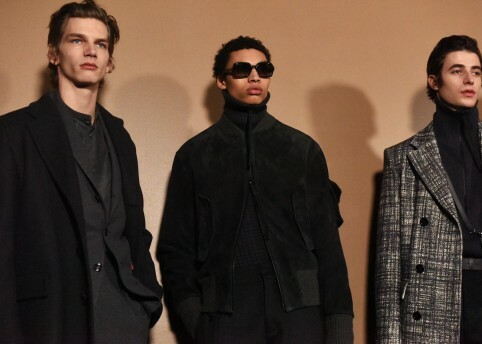 Having introduced Celine menswear to the house for the first time at his debut show in September last year, this season was Celine’s first time on the menswear schedule. 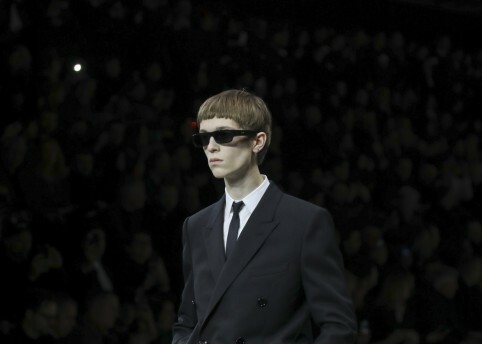 Last season’s Celine show caused waves that are yet to settle. 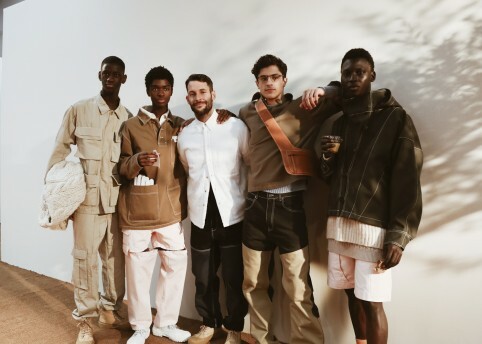 Hitting reset on the maison’s codes with a single, defining drum crack, the designer presented a collection inspired by and designed for today’s Parisian youth. 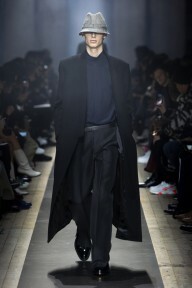 Pulling from the backbooths of bars throughout the French capital and plugging directly into his own laser-sharp vision of Celine’s ethos, and his own. A new beat was set. And the beat goes on. 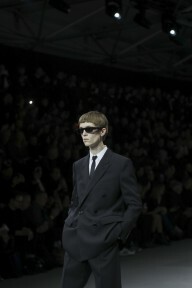 Inside a vast, black custom-built venue on Place de la Concorde, guests sat on tiered stadium seating, facing a full-length window onto Paris, the city of lights: low beams, hazy street lights and a piercing full moon. While – more importantly – those on the streets could see in. After all, Hedi creates in harmony with what he sees around him – plus, it’s good to know what you’re going to be wearing next season. At one side of the venue stood a large spherical pendulum filled with neon bars that strobed and crackled with electric pulse. Out the speakers pulsed an original track, Philosopher’s Calling, written by Canadian collective Crack Cloud and the first model spun into view on a revolving floor that orbited the installation. 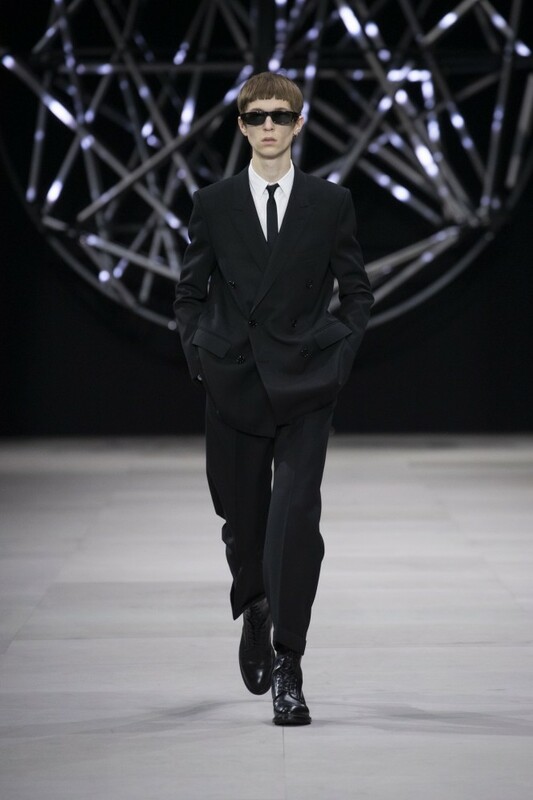 A black and white double-breasted suit, high-waist pleated trousers cropped shorter and cut wider and looser than Hedi’s synonymous close-to-the-bone angles to provide a certain amount of freedom to their wearer. 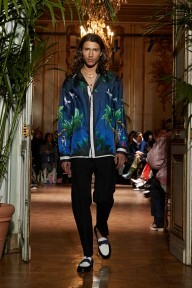 Now in full flow, you could see Hedi’s vision in action: his first season six months ago was something of a realignment, orientating Celine’s design codes with his own. From this centre point, he can build. Slimane’s most recent Celine menswear campaign featured four exciting, nascent British bands: Drug Store Romeos, Walt Disco, Lady Bird and Ugly. Shot in London late last year, it seems that his time back in the British capital has rubbed off on him. 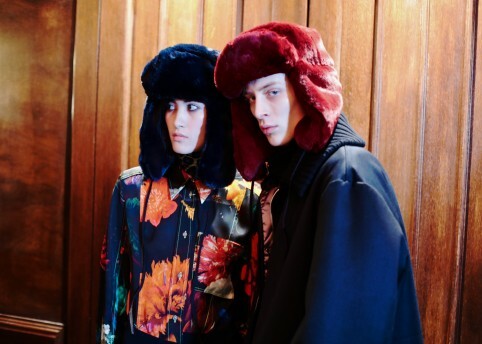 Titled ‘A London Diary: Polaroids of the British Youth’, this was Hedi’s ode to London, via a Parisian, Celine lens. Not only did Hedi’s campaign faces walk in the show – alongside several musicians from Swim Deep, Bag of Laughs and Lucia – but the whole collection was a clever nod to a city Hedi has long been tuned into: see his days documenting the rising 00s indie scene. 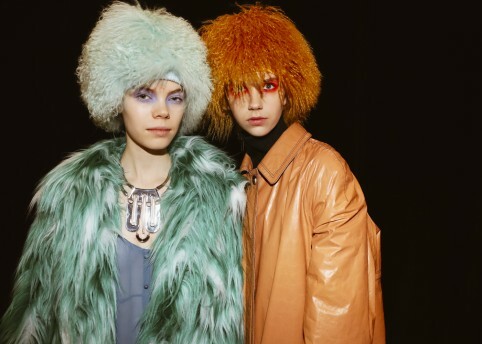 Outerwear aplenty: we got parkas, thick overcoats in check, camel (very Del Boy), tweed, houndstooth and sheepskin (à la John Motson), duffle coats, striped ties underneath V-neck knits and collarless Beatles jackets – their outfits distilling British youthquakes from the 60s to the present. With many of the boys sporting a sort of 80s, half mullet – the kind you do yourself in the bathroom mirror one evening – it was a bit Gregory’s Girl at times. At a squint, the boys walking could easily have been 80s post-punk pioneers: Ian McCulloch, Mark E. Smith, Ian Dury, Edwyn Collins, Ian Curtis, and, in the case of one full leather look, Alan Vega. Prior to the show, a series of black and white geometric patterns sporadically appeared on the Celine Instagram feed created by three artists: David Hominal, Anneli Henriksson and Cody DeFranco. Here, these shapes went glam, translated across a series of jackets and coats embroidered to an inch of their life that shimmered like the Effiel Tower on the hour. 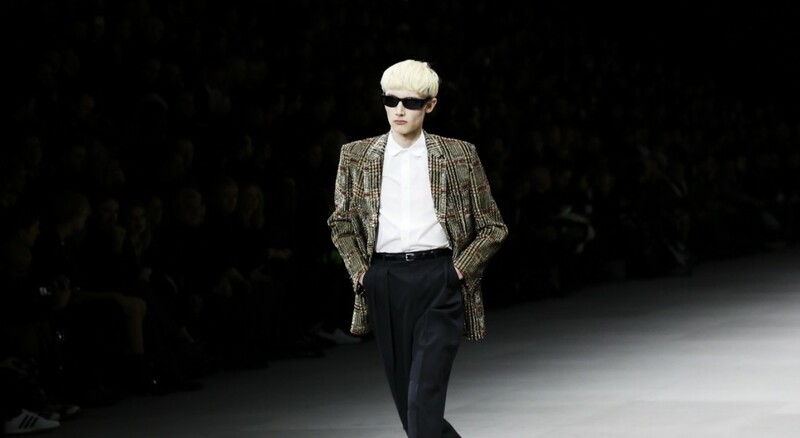 All the while, Hedi wardrobe staples filtered through: from leopard print coats to razor-sharp trousers; teddy jackets; and immaculately cut leather jackets that stick to the skin in all the right places. While sunglasses featured throughout, scaling from retina-skimming to Dirty Harry wraparounds, Private Eye Lemmy Caution’s futuristic opaques and Peter Fonda’s Easy Rider semi-transparents. As the final model exited. Lights dimmed, the pendulum orb swang and the twisted sound of James Chance’s sax echoed around the venue. Revolving around the pulsating neon lights as he played, there was something a bit Lynchian in the scene, a bit Jim Jarmusch also. In 70s New York, Chance and his Contortions ushered in a radical new creativity that shook audiences off their feet – literally, he would physically shake watchers out of their apathetic stupor. The takeaway lesson: never sit comfortably. Where Hedi’s first show was a triumphant drum crack intro, now he’s riffing – and he’s shaking us to the core.